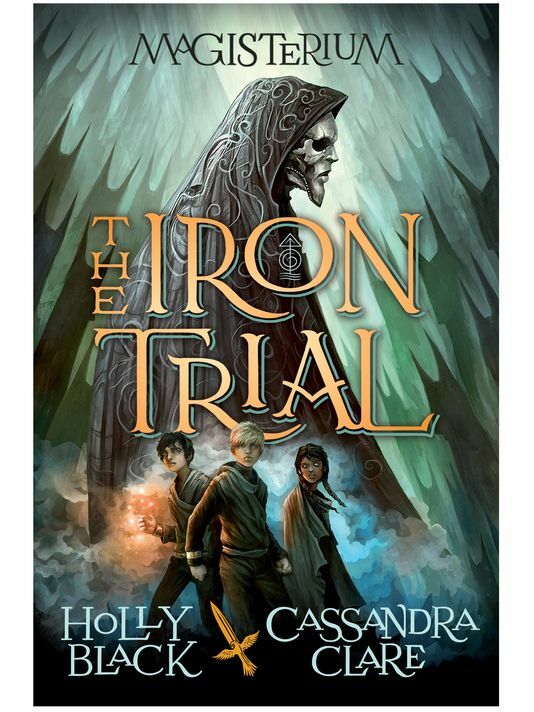 Are you ready to see the cover of The Iron Trial from Cassandra Clare and Holly Black’s new middle grade series Magisterium? USA Today hasn’t only shared the cover but there’s also an exclusive excerpt. Aaron is in the center. Callum is on his left, and Tamara on his right. How cool is the cover/the excerpt and did you notice the sweet dedication to Holly Black’s son Sebastian? I thought the cover was about to be revealed on May. Great cover! It has a creepy atmosphere which I really like. It looks nothing like I’d imagined but then I forgot about the middle-grade aspect. So excited for the release! I’m 37 and am super excited for this series. I love Holly Black and Cassie Clare’s vivid imaginations. A good story has no age limit. Här kommer omslaget till den första boken i The Magisterum serien, kallad The Iron Trial. Denna serie som Cassandra Clare skriver tillsammans med Holly Black inriktar sig på mellanstadie ungdomar. Looks interesting…..what do you guys think? i love cassie’s writing and love tmi and tid, but i have to say that this looks so much like harry potter. i mean, a young boy that goes to a school for mages, that has a boy and a girl as friends? and when i found out the girl was a mage with no mage relatives it just screamed hermione, i’m sorry. the cover is fantastic, though.